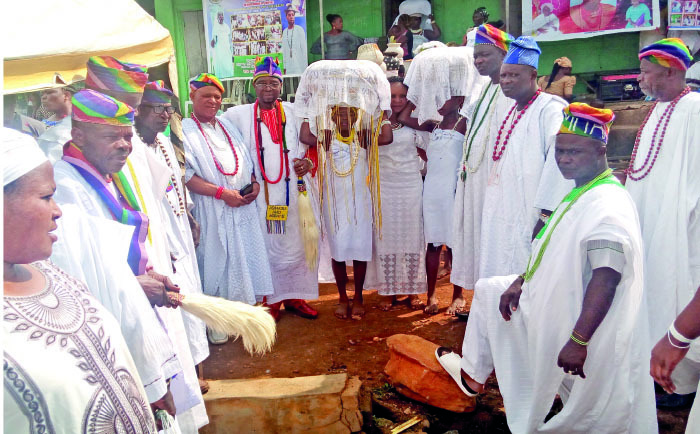 Recently, Ido-Ile, in Ido-Osi Local Government Area of Ekiti State was agog with a week celebration of some Yoruba deities. They included Obatala, god of justice; Orunmila, god of creation; Osun, water goddess; Osanyin, divination god; Ifa, also a divination god and Sango, god of thunder. Each day of the week was devoted to a god or two for appeasement and worship. There were also displays by some masquerades. The festival was sponsored by Madam Ike Obaleye, head of Sango worshippers in the South West. A native of Ido-Ile, she practices as a traditionalist in Ibadan, Oyo State, in a place she called her traditional healing home. The festival attracted folks and initiates of the deity from far and near. One of them was a man from the South Eastern part of the country, Ngoka Anthony, from Owerri West Local Government Area of Imo State. He was conferred with a traditional title of Atunluse of Ido-Ile as a result of his rapport with the community and development effort. “The culture unites us. Being an Ibo man coming to celebrate culture in a Yoruba land binds us. I have come to show my respect as a person. I come here every year to celebrate with my people. I am part of this as a traditionalist. It is by virtue of being a traditionalist that I always come every year to be part of this and it gives me fulfillment. “My gains include happiness and the fact that this festival unites us. Sango is a god of thunder and lightening. He is called Amadioha in our culture because of his thunderstorm and lightening. He protects you from evil and in my culture Amadioha also makes us to have bountiful harvest in our farms. “This is my third year of being part of this and l always come with my family and friends to be part of this. I support this so much because we must not forget our culture. We must not allow foreign religion or culture to make us forget our culture. There are differences between what we do in celebrating our culture in the East and what obtains here. “For instance, we celebrate Amadioha during the rainy seasons and there are always thunderstorms at such times. But such festive culture is fast fading in my part of the country because the foreign religion is destroying this aspect of our culture. They no longer exist in their raw form like we have it here in Ido-Ile. This is part of the reasons we come here to feel this and be part of it. A community leader and Oluwo Akepe Ola of Ido-Ile, Chief Olayiwola Bankole, (Head of Ogboni) said: “I am to preserve our cultures the way our forefathers did it in their times and with which they were prosperous, wealthy and had many fruitful children. “Today, we have three masquerades we are celebrating as part of this festival. One of them we call, Aberemotuntunide, meaning a needle always passes through clothing materials. It signifies that life must continue. Every year we must have this masquerade. His name means needle, which usually weaves the clothing materials and such endeavour occurs from time to time. “The second masquerade is Ako Eegun. It is from a powerful masquerade family of men who possess great powers. They can assume the physical form of anything such as a lion, tiger, and elephant. They can become anything and can kill any animal. They also possess powers that bring goodness to people and cure them of all their illnesses. “I live in Ibadan. I gave birth to my third baby without having to go through Caesarian operation this morning thanks to the gods of Mama Obaleye. My first and second born were through CS. When we approached Mama Obaleye, she assured us that by the powers of the gods and Sango deity, and the herbs she would give, I would not give birth through Caesarian operation again. Since then, she has been administering the herbs and making prayers for me. Today, with her help and the gods and the grace of God Almighty, I gave birth to my baby without operation. “The hospital doctors used to say that I have a pelvic assessment of a man which has been making it difficult for me to give birth to my babies with ease. But the Mama who is the traditionalist said with the herbs, it would be easy for me to give birth without a CS. “Since the month I took in I have been going for traditional ante-natal care at the traditional clinic of Mama Obaleye and eventually today I gave birth to my baby without having a CS.